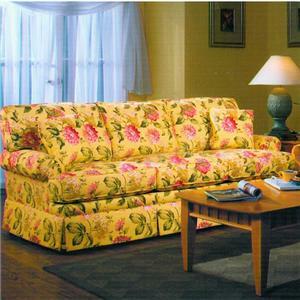 The traditional sofa has a great cottage/country flair to it for a living room that will make you feel right at home. 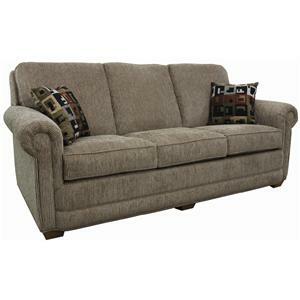 Great style details include the camel back style with ruffled top trim, wing back side, and button tufting. 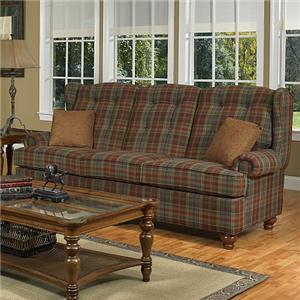 Rolled arms, welt cord trim, and a skirt base complete the look of this cozy sofa. Relax with family and friends as you watch TV or simply chat with the inviting comfort of this sofa to make everyone feel welcome. Coordinating items also available (not shown): loveseat, chair, and ottoman. The 9700 Wing Back Camel Back Sofa by Lancer at Town and Country Furniture in the Hamburg, Buffalo, Lackawanna, Eden, NY area. Product availability may vary. Contact us for the most current availability on this product.